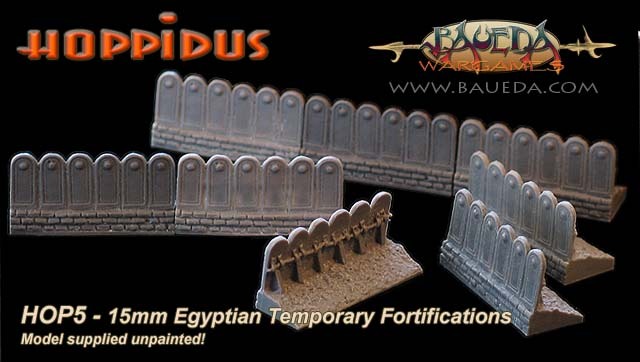 15mm Egyptian Shield Fortification AVAILABLE NOW! This is a modular set of Egyptian Shield Fortification similar to those used by the army of Ramses encamped at Qadesh. 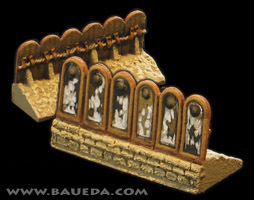 The complete set as shown consist of 8 freestanding individual elements of TF for DBM or any other rule system that uses 40mm wide element bases and can be used as field fortifications or to make a fortified camp large enough to hold 4 elements of baggage (and/or 15mm New Kingdom Egyptian Tents) if placed in the middle of the table or up to 8 if placed against the table edge. HOPPIDUS is a truly modular system, and all elements of this set are compatible with the rest of the range. 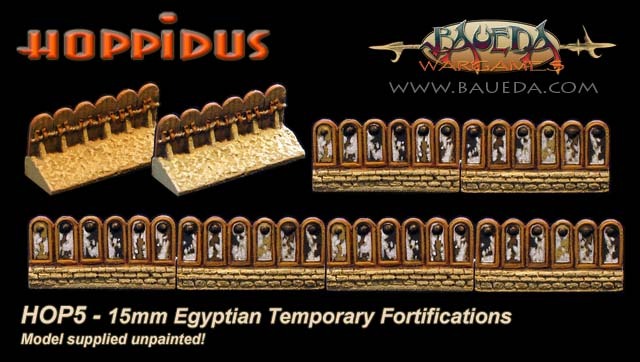 This means you can also add more elements from the complete HOPPIDUS range to expand and customize this basic set, for example using it together with a DBA4 Egyptian Camp set to make an even large enclosed fortified perimeter that can be used for a scenario game. Click on the image below for the full picture! This is a booster pack to increase the size of your fort by two TF. The pack includethe modules required to make the two complete Temporary Fortification elements.